Got the whole family with you? Girls or guys weekend? Then this is the room you are searching for! Grand Cayman is our largest room boasting two queen beds and a fully stocked kitchenette. This room is located in its own private building with its own private courtyard, just perfect for sipping wine with friends or dining al fresco with the kids! Grand Cayman faces the famous Capitola Esplanade and makes walking to shops and restaurant a breeze. The beach is just half a block down the Esplanade and we offer beach towels in our lobby should you forget yours! Grand Cayman includes cable TV, free Wi-Fi, a private bathroom with a shower, mini fridge, microwave, kitchen sink, dinnerware, Keurig coffee maker, snacks, hair dryer, Capitola Hotel Signature Bath Products, iron and ironing board. 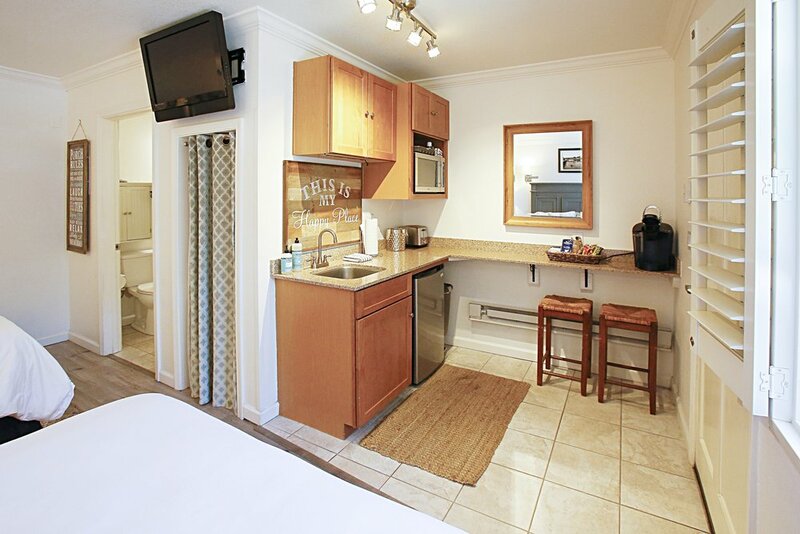 Our daily continental breakfast is also included with this room. What are you waiting for, book today!